I'm afraid life is moving much faster than I'm able to blog. My dear reader Jo asked me to show my fashion week outfits. And the thing is, I've had these pictures since last Friday and I haven't been able to post them. That's a week ago! 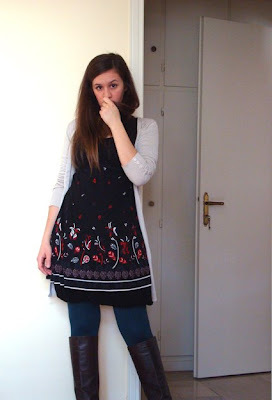 Anyway, this is what I wore last Friday to work and then straight to the first day of Fashion Week Athens. Charcoal flower-print dress, BERSHKA. Dove-grey cardigan, MARKS & SPENCER. Teal tights, CALZEDONIA. 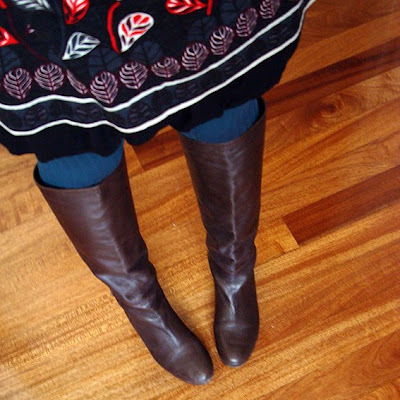 Brown boots, INCI. Black skirt peeking from under the dress, BERSHKA. That's right, I wore a skirt under my dress. It's a great way to add some length to it, now that after several washes it's starting to look a bit inappropriate short. It also adds extra warmth, not that this is relevant now that the weather is getting all summery. But quite an awesome trick for wintertime! Is the dress embroidered or printed? Either way, lovely pattern to the print, and it adds a nice pop of color. Hey! Is the dress from the spring summer Bershka collection? Love the combination with the royal blue tights! eleni: Thanks for the compliment! I'm actually too scared of hairdressers to cut my hair, so I just trim them on my own. Antoinette: It's just printed, but I'm guessing the inspiration of the designer was definitely ethnic embroidery. Katerina: Actually, I bought it more than one year ago. It was from the fall/winter 2008-09 Bershka collection and I got it on sale for a mere 6 euros. And it's wool blend! So warm, but after some washes it has gotten a bit too short. Hence, the skirt solution. 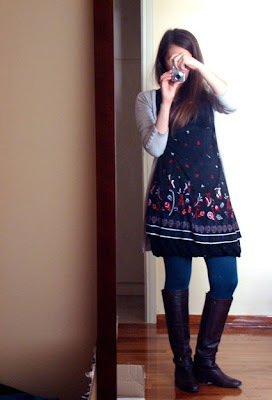 i reaaaally love the tights!and the dress of course!check out my blog mademoisellemyrtilo.blogspot.com!!! you look great. I like the tights colour and the dress. Ohhh..That look! 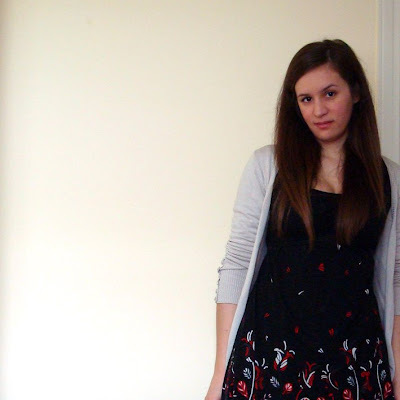 I love the way you combined the dress with the skirt, that's pretty clever! I've never seen it before! The colors are so happy, too. I'm not a fan of tights but you really make me reconsider it... P.S. Your hair looks great this way. Oh! Just a blogging question, cos I'm new at this: How do you make something you write a hyper link? For instance write Lopi and when someone clicks it send them directly to your blog/website? Thanxs! i idea me ti fousta kali k praktiki,tha peiramatistw! love the color of the tights!